Pieces of You and Me will undoubtedly delight younger teenagers. As an adult reading it, I will say I was entertained, and found the story and premise enjoyable. Rylee & Chase were buddies, until his mother took him away from his alcoholic father. Moving back home with his now sober father, Chase surprises Rylee with his reappearance. I believe that the moral of the story was self-fulfilling prophesy. Chase feared having to move away yet again, leading him to truly believe he would get too close to Rylee again, only to hurt her by moving. This prophesy was not only from him, but also Rylee's friends. Teens are going to eat up how romance-centric the story is, revolving around memories of the past and sweet moments from the present. Intermixed with angst of meddling friends and good and badly behaving parents. This is one of the first Young Adult novels I've read where both sets of parents were not only present, but involved. They cared. They made rules. They weren't irrational and immature (minus the mother and her new husband). That was a breath of fresh air. Some of the plot I was angry with, but had to imagine it from a teenager's point of view. Still, even at 10 years old, I would have got the idea that a sixth-grader has no say in where they are going to live. So the reason why Rylee's friends were angry at Chase were irrational, shallow, and beyond annoying at times. Frustrating. It made me fear for their intelligence. But eventually, Rylee gets with the program and realizes no child could dictate where they live, and how horrible it would be to have no roots. As for keeping in touch, she didn't continue to stay in contact either. I wish Chase would have been more clear with Rylee, instead of propagating this I don't want to hurt you phrase. He never explained how he feared his mother would call him back to her home. As for Rylee's friends, I blame Rylee for keeping this from them. Typical teenage angst. But I also thought Mya and her boyfriend's behavior was bullying, right down to throwing things at Chase in class. What are they, 10? As for the missing cellphone, how about just say who stole it in the first place? These things annoyed me to no end. If any of them were my children, we would have had anti-bully, judgmental, and self-fulfilling prophesy conversations. I was baffled. They were discussing college, had boyfriends, but threw things during class? While the storyline itself will fade with time, my feeling of how the author let Chase down won't. Even at the end of the book, no one, not parents or Rylee, told Chase his living situation wasn't his fault. He was the child of an abusive alcoholic father and a narcissistic mother. Never able to gain friends because of never being anywhere longer than a few months, when he finally comes 'home,' Rylee's friends treat him horribly immediately, but first they are shallow and call him 'hot.' I lost respect for Rylee for allowing her friends to control her, under the guise of caring. (It felt almost abusively controlling. Telling a girl's boyfriend to leave her alone, because he would break her heart. So he breaks up with her because he was terrified to hurt her, then the friend comforts the girl. If that doesn't sound like manipulative and abusive, I don't know what is. Nothing like saying 'I told you so' while comforting your friend with ice cream, when you were the reason for the break up. And the reader was just to accept this as normal behavior... as if Mya was the best friend on earth for saving her friend, when it was controlling and abusive behavior.) I also lost respect for Rylee because she hid her relationship with Chase. I can't buy friendship/relationship if there is no respect. Actually, I can't respect anyone who wouldn't tell their friends how horrible they are for mocking people leaving an AA meeting. Alone, Chase and Rylee were good – I thoroughly enjoyed their evolution. I even enjoyed Rylee's Mom and Chase's dad. But the rest of the side characters were irredeemable in my eyes, and made the story uncomfortable (they weren't meant to be the conflict). None of this is what I would want a younger reader to think is acceptable behavior. If the author had had one of the narrators think it was poor behavior, I would have found no issue with this. But it was just accepted as normal, and all of it was dysfunctional and toxic. Recommended Young Adult Age Range: 12+ with talk of alcohol addiction. 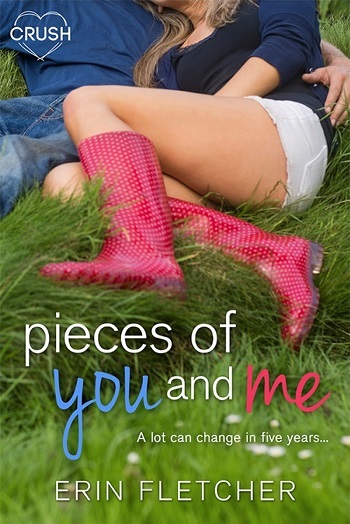 Reviewers on the Wicked Reads Review Team were provided a free copy of Pieces of You and Me by Erin Fletcher to read and review.